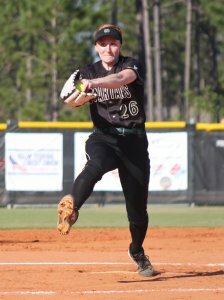 Sydney Supple threw a perfect game in her first conference outing this year. 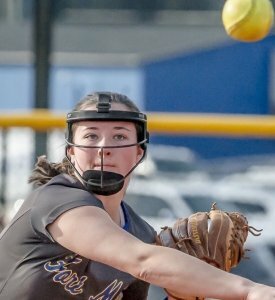 Not exactly the case for Sydney Supple, who was an Extra Inning Softball National High School Player of the Week runner-up last week, but her numbers this week put her at the top as the sole honoree. Sydney Supple went 3-0 in the circle her first week of the season and had three home runs. Photo: Dan Frank. 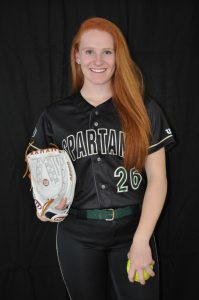 The Northwestern signee, who is as skilled with her bat as she is her pitching arm, started the season two weeks ago playing in Florida with her Oshkosh North (Wisconsin) High team and smacked home runs in each of her first three games. She also struck out 32 batters in 20 innings in the circle. This past week, the 2019 Extra Inning Softball All-American was even more impressive as she began conference play. In the first of three games for the week, Sydney pitched a perfect game as she strike out 11 of 15 batters she faced during the run-rule shortened five inning win. She also had two home runs in the game. Syd followed that up with three more shutout innings in the second contest of the week and at the plate went 3-for-3 with four RBIs. In the final game of the week, the two-time Gatorade State Player of the Year came on in relief to pitch 4 2/3rd innings of shutout ball and hit the go-ahead RBI triple during the Spartans seven-run inning in the 7th. For the week, Sydney went 6-for-9 (.667) with nine RBIs, five runs scored and also had 24 K’s in 12 2/3rd innings as she didn’t give up a run in three games and allowed just one walk. The Northwestern commit currently has a record of 6-0 with a 0.86 ERA . For the season, the tall lefty is 6-0 with two shutouts—including the perfect game—and has 56 K’s versus just four walks in 32 2/3rd innings of work with a 0.86 ERA and a batting average against of only .149. With the bat, she’s hitting .611 in seven games with five home runs, a .696 on-base percentage and a slugging percentage of 1.500. And she’s been walked four times intentionally, a big show of respect by her opponents. The long-time Beverly Bandit travel ball standout is a Top 10 player in the 2019 class and has taken her game to another level this season it appears. * Maddie Penta, a junior pitcher for Bohemia Manor (Chesapeake City, Maryland) High and an Auburn commit, set a personal-best record as she had 20 strikeouts in a game this week and in four games had 59 K’s in 21 innings while giving up just one hit, five walks and no runs. At the plate, she went 9-for-13 with three home runs. * Avery Croxall, a junior pitcher at East Nicolaus (Trowbridge, California) High pitched 21 innings and had 36 K’s and only two hits with a 0.00 ERA. She limited opponents to a miniscule .029 batting average as she gave up just two hits and had a 3-1 record, the one loss being on an unearned run to Heritage High. For the season the Pacific commit continues to roll as she’s 12-1 with a 0.11 ERA and one perfect game this season. 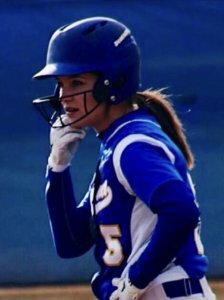 * Lauren Vaughn, a freshman at Wheaton North (Wheaton, Illinois), batted .478 and had two home runs, six RBIs and six steals in eight games as a starter at third base. 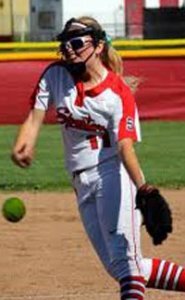 As an 8th grader last year she committed to Syracuse and in the summer plays for the Beverly Bandits 16U team coached by Cray Allen. * Kayla Chavez of Chino Hills (California) High was on fire at the plate last week as the sophomore went 5-for-5 with three home runs, a double and single in one game and went 2-for-3 with a home run in the second game. For the season the sophomore third baseman has 10 home runs and nine doubles with 30 RBIs. 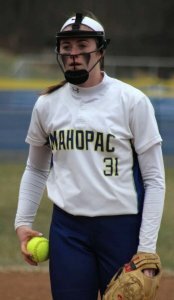 * Shannon Becker, a sophomore pitcher for Mahopac (New York) High went 2-0 in the circle with one of the games being a no-hitter. For the week she had 36 K’s, a 0.00 ERA and even hit a double and single herself. Season-wise, Shannon is hitting .417 with a .533 on-base percentage. As a 6-foot pitcher she is 4-0 and offensively she is hitting .417. * Emma Tisdale, a freshman at Fort Mill (South Carolina) High, plays shortstop and third base for her team and last week hit .636 with three home runs and 16 RBIs. 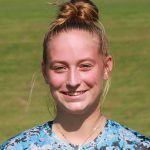 The talented infielder who plays for Team NC – Eaton when not in a high school uniform, is hitting .557 for the season with six home runs and 32 RBIs. * Jayda Coleman, ranked as the #1 player in the junior class, is having another strong year for The Colony (Texas) High and it’s not just limited to softball. On the diamond, the Oklahoma commit went 5-for-6 with a triple, double, pair of walks, six stolen bases and three runs scored. 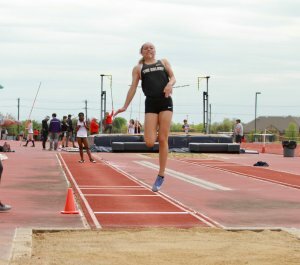 And the great all-around athlete—despite not having done any track workouts or competitions since last spring—went to the District meet and qualified in for Areas as she was the district triple jump champion, came in third in the long jump (setting a school record) and took fourth in the high jump.